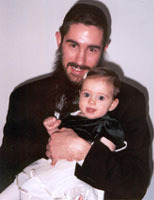 Aryeh and his wife, Raizy, are now on Shlichus in West Bloomfield, Michigan, with their two daughters. They are both working on the Boys Volunteer Division of The Friendship Circle. Zalman & Sheina Myer-Smith live in S. Paul, Minnesota. Zalman is the 14th Shliach to the State of Minnesota and is the Director of It's Good to Know (www.itsgoodtoknow.org) - an organization headed by Rabbi Manis Friedman. They have two children, Yehudis Bracha aged 2 and Menachem Mendel aged 6 months. Avi learned for 4 years in Morristown and in 2001 returned to Montreal in order to complete his degree in psychology. Upon completion, he enrolled in McGill University's social work program. He has now almost completed his Masters. He recently got married to Faye Rodzynek in Toronto. Mazel Tov, Mazel Tov.